Welcome to the Princeton Theological Seminary Library. This self-guided tour will acquaint you with the major public spaces in the new building (approx. 130,933 sq. ft.). This self-guided tour begins in the lobby, assuming you have just walked into the library. The Brick Café features fresh brewed Small World coffee, lattés, iced coffee, frozen drinks, salads, sandwiches and other tasty items available for purchase, café style seating, and serves as an informal gathering spot for the PTS community, with nice windows looking out on Mercer Street. Eco Note: The long table was fashioned out of trees felled from in front of the old Speer Library and the small tables are inlaid with marble from the walls of Speer Library. Wall-mounted, digital signs feature campus events and scenes. There is a slot on the outside of the building to the left of the entrance for returning books when the library is closed. When the library is open, please return materials at the Circulation Desk. Down the hall and to the right are restrooms and water fountains. The Meeting Room and Daniel J. Theron Assembly Room, like many of the public rooms in the Library, can be reserved by members of the PTS community through the Master Calendar. These rooms are for meetings, Continuing Education events, and other occasions. Historical note: The Theron Room is named for Daniel J. Theron, who was born in the Orange Free State, Union of South Africa. He came to Princeton Seminary, where he earned his doctorate in New Testament and served as a Teaching Fellow, Instructor and Assistant Professor in New Testament from 1946 until 1958. Theron established several endowments for church purposes, including scholarships for black African theological students and church workers at four theological seminaries in the Republic of South Africa. He also donated the funds for this room in the new library. The Circulation Desk is a primary service point for Library assistance in the building. This is where patrons apply for cards, check out books, and make general inquiries. Just beyond the Circulation Desk, note the COPY CENTER and NEW BOOKS display area. Display cases in the “drum” and along the far wall feature exhibits; columns support computer terminals for quick access to the library catalog and research databases. Low shelving features new books, atlases, newspapers, and ready reference materials. Note the reference tables and soft seating, offering great study spots. The main body of the Reference Reading Room is a major study space in the library. The shelving down here continues from the collection upstairs. Patrons with a PTS network ID can use the workstations on these desks, which feature both the Mac and PC operating systems. 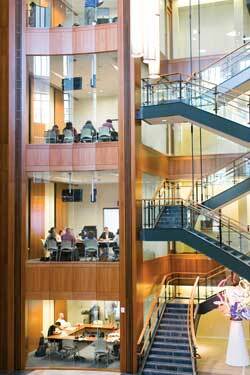 The 2nd and 3rd floor feature workstations in the same area. There are printers on every floor. The compact shelving on the Lower Level houses several important resources: Circulating Collection F–Z; Reference 2 A–Z (secondary reference collection); Periodicals (current issues of journals beginning with K-Z*, shelved by title; older, bound together issues of journals A-Z, shelved by call number); Folios (all folios: reference, periodical, circulating); and Media. *Current issues of journal titles beginning with A-J are located on the periodical display shelves on the first floor of the North Wing. Why use compact shelving? The hand-crank compact shelving throughout the building makes maximum use of space, enabling the library to keep its entire collection on-site—a major benefit to researchers. Check to make sure the rows are unoccupied before moving the shelves. The Seminary uses the Iain R. Torrance Atrium for a variety of events throughout the year. Sir Iain Torrance was Princeton Theological Seminary President from 2004-2012. The Theodore Sedgwick Wright Room celebrates the life and ministry of Theodore Sedgwick Wright, African American abolitionist and first African American graduate of Princeton Theological Seminary, Class of 1828. Art note: Note the sculpture featured in the Iain R. Torrance Atrium. The title of the stainless steel, aluminum, neon and oil paint work is "Unending Love" and it was created by New York based Korean artist Hyong Nam Ahn. Its presence here was made possible through the generosity of Seminary Trustee Jinsoo Kim and Mrs. Kim. There are four seminar rooms/”smart” classrooms in the building, one on each floor in this area. These rooms feature document projectors, Smart Boards, and other tools, and are reserved through the Registrar. Throughout the building and amongst the stacks, you will note mounted iPads linked to the library’s catalog and other resources, allowing for quick browsing. This hallway (and the parallel hallways on all floors) is home to two important spaces in the building: restrooms and the official “Areas of Refuge.” The latter are safe places to wait for emergency personnel if you are unable to exit the building during an emergency. The Women in Ministry Room honors women associated with PTS in varied capacities such as alumnae, faculty, administrators, trustees. Eco Note: The small tables have marble inserts recycled from the walls of Speer Library. These small group meeting rooms are available for public use on a first come basis. The Center for Barth Studies sponsors conferences, research opportunities, discussion groups, and publications related to the works of theologian Karl Barth (1886-1968). Special Collections at Princeton Theological Seminary houses more than 75,000 printed works and over 5,175 linear feet of archival and manuscript material. Major collections include the Seminary archives, rare books and pamphlets, personal papers, records of organizations, research collections, and non‐textual materials related to the history of the Presbyterian and Reformed traditions and ecumenical Christianity. The Alumni Room is, for most of the year, an open study space available to alums as well as the rest of the Seminary community. Occasional alumni events or other meetings may take place in this room throughout the year. The South Gallery is the largest open public space in the building, offering a variety of desks and soft seating options, two small group meeting rooms, and a seminar room in the center that is used for classes. The South Gallery offers a spectacular view across Mercer Street to the Seminary campus and ample window seating, perfect for reading and reflection. This room is available for open study and reading. There may be times throughout the year when events like readings may be scheduled here. Historical note: The Presbyterians have a long history in mission to Korea, and the Presbyterian tradition in Korea is a very strong one. This room is dedicated to the longstanding relationship between our Seminary and Korean Christians. The Christian Education Library, or Reigner Collection, holds materials for the practice and understanding of the educational ministry of the Church and is designed to provide a wide and current range of Christian formation resources. Thank you for visiting the Princeton Theological Seminary Library. We hope to see you again soon!